Many people quite often connect weight loss with the frightening thought of a diet and working out in a gym. But in order to get slimmer you just simply need to exclude unhealthy food from your menu. Food is the main source of nutrition and vital elements for human body, it works like a fuel and keeps us going. Most of the time we do not consider all the impact of sustenance on our organism. Though its main function is to nourish us it is also able to aggravate our existence. Here are some foods that you should probably exclude from the diet, especially if you are an athlete. It will be hard to keep away from it since food in a way is an addiction, but the outcome is most rewarding. 1. Crisps. Potato originally do not belong to a healthy food in any form of preparation. Crisps contain various flavour enhancers, carcinogens and fats. Frequent consumption of crisps is a guaranteed gain of weight for you. By the way French fries are just as bad. 2. Sparkling water and sodas. Most harmful sodas contain sugars and colourants. Usually they are very addictive. During training it is suggested to use usual still water. 3. Fast-food. The name on itself sounds sinister. 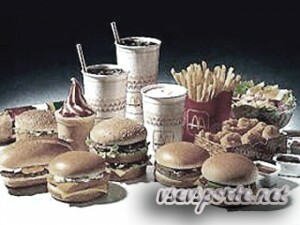 Do you know any positive nutritional side of the fast food, not including a low price and fast preparing? There are none. If you hungry why don’t you satisfy your appetite with some vegetables? 4. Fourth place in here belongs to mayonnaise. Of course the talk is not about home made but purchased mayonnaise. Within just a few weeks after taking it off our menu the improvements in the figure will be seen. Different kind of sauces and ketchup could be added in here as well. The amount of natural products in these is low. It is recommended to exclude mayonnaise from your diet or substitute it with at least low fat mayo. 5. Salt and sugar. Sometimes they are described as a white death. Salt creates an obstruction in organism, preventing water from normal circulation. Not every person can go cold turkey from salt and sugar but you could reduce to a food containing just naturals sugars and salts. If you want something sweet change sugar to honey for example. 6. Alcohol. From early childhood we have thought that alcohol is evil. And it is true. It is heavily recommended to quit in a way to lose weight and to be a successful athlete. 8. Fried food. During frying most of the useful ingredients are being destroyed. It would be better to replace frying process with boiling or roasting. 9. Sweet food. Good substitute for it would be dark chocolate or honey. 10. White bread. All products baked from flour are just as bad. The best substitute is wholegrain bread.